The Obama administration announced last Thursday that it will support a critical missing link in the fight against conflict minerals: independent monitoring. 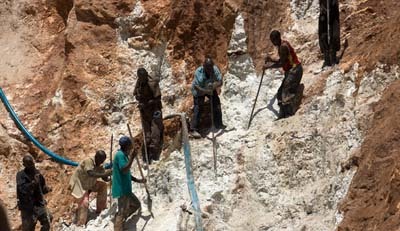 This is a major step in the long fight against the illegal trade in conflict minerals. The State Department's Special Advisor to the Great Lakes Region, Ambassador Barrie Walkley, announced at the EICC-GeSI electronics industry conference on conflict minerals in Philadelphia, PA, that the U.S. Agency for International Development, or USAID, will provide over $4 million to support monitoring, auditing, and tracing activities in Congo and the Great Lakes region. These are new funds added to the pie, bolstering the $11 million that the U.S. government announced last year to assist with training and traceability, and will come from USAID's Complex Crisis Fund. We applaud the administration for this important step, which essentially helps provide an independent check and balance on the current pilot projects. A consolidated monitoring system is currently a key gap in the current efforts in the Great Lakes region on minerals. The variety of projects initiated by key industry players and by the Congolese and regional governments are good, important steps, but many of these projects on the ground are controlled by the same actors who were previously complicit in the conflict minerals trade. Independent monitoring would provide eyes and ears on the ground to make sure that there is transparency. Building on an excellent proposal from Jason Stearns and Steve Hege, the Enough Project has been advocating for an independent monitoring system since 2010. The system—which has worked well for monitoring the timber trade in Cambodia, for example—should include a team of independent experts to conduct spot checks to see if mines, trading routes, and traders still involve armed groups, and then to penalize conflict actors. Last year, Congo took an important step towards monitoring through the mine qualification and validation activity, during which a team from the Congolese government, local business, the U.N, and civil society went out to mines in certain parts of North and South Kivu to check for armed groups and child miners. They validated 19 out of 46 mines in Masisi and Kabare, Mwenga, and Walungu. But this initiative needs to go further, as the group did not spend an extensive time on the ground. The methodology of the project must also be improved to be more comprehensive. Moving ahead, the Obama administration should take two key steps: First, gather the key actors on independent monitoring and hash out the remaining issues. For example, the International Conference on the Great Lakes, or ICGLR, has approved an independent monitoring system, but certain countries are still holding up the final adoption of its work plan because of outstanding questions about penalties. The Public Private Alliance on Responsible Minerals Trade could be used for this discussion, for example, since it has governments, companies, and NGOs. Then, once full agreement is secured, the administration should use the funds to support the ICGLR's work on this issue, since it has important political buy-in of the governments of the region.